The Senate President, Bukola Saraki has released a statement responding to the fresh call for his resignation by APC national chairman, Comrade Adams Oshiomole. Emmy. Ng News had reported on Friday thatOshiomole at a press briefing in Abuja, said his party will do everything legal to ensure that Saraki is impeached and voted out of office come 2019. In his response in a press statement which was released by his media aide, Yusuph Olaniyonu, Saraki said Oshiomole is behaving like a rain-beaten chicken and that he is merely engaging in wishful thinking. 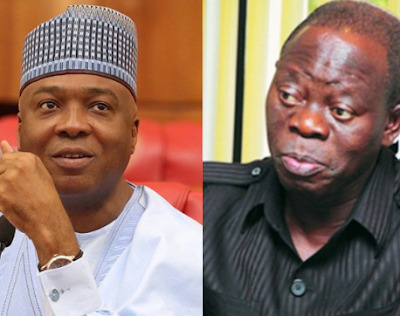 In his statement, Saraki said one million of Adams Oshiomole cannot remove him from office.